Dropped into a story that's little more than a series of set pieces cobbled together with recycled plot contrivances and stock characters, the computer-generated dinosaurs, which generated such awe and terror 25 years ago, have finally been rendered boring, merely a requisite threat that could have been replaced by Transformers or zombies, for all it would affect the repetitious action beats of spot, scream, and run. Read Mike's review at KCActive. A tad-too-familiar murder mystery that works best when it focuses on the barely buried ferocity of its main character. An original and genuinely terrifying story of a family in crisis, suggesting that guilt and secrets (often one and the same) can destroy as surely as any evil spirit. Zhao's approach to filmmaking is determinedly verité. She hasn't just cast representational actors; she has affectionately developed her script around their stories. It's the antithesis of Hollywood whitewashing. Read Beck's review at KCActive. Star Wars fans may love Han Solo, the brash, arrogant outlaw-with-a-conscience portrayed by Harrison Ford in the original trilogy. But have Han Solo fans spent the past 40 years wondering about the origin of his surname? Where he got his blaster pistol? What exactly the Kessel Run is (which Solo bragged the Millenium Falcon made "in less than 12 parsecs")? Well, "Solo" is here to answer these questions anyway, by way of an origin story. 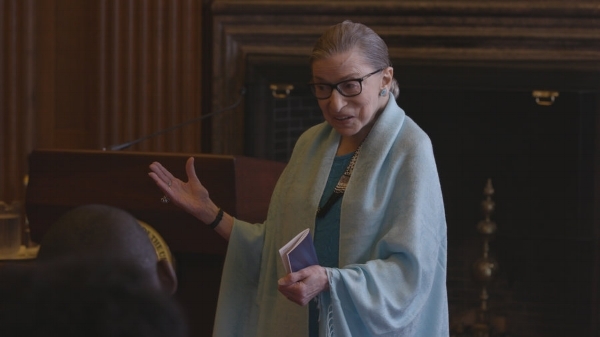 The acronym RBG, a nod to the late combative rap legend Notorious B.I.G., suggests the filmmakers view Supreme Court justice Ruth Bader Ginsburg as the pop cultural icon she has become over the last 15 of her 85 years, the subject of Internet memes, SNL impersonations, bobbleheads, T-shirts, and other merchandise (many featuring the justice's head grafted to Wonder Woman's body). This is Ginsburg the Dissenter, the "notorious" voice of liberal dissent to the decisions of our highest court's increasingly conservative majority. A middle-aged divorced mother and successful painter living in Paris, Isabelle seems to have no problem attracting men. In fact, the film is essentially built around a series of liaisons with lovers, old and new, that flares up but inevitably sputters. Read Mike's review of "Let the Sunshine In" on KCActive. Despite the occasional shot of a Sherpa village or eastern religious temple for color, the film's focus stays firmly on the western interlopers.he film's focus stays firmly on the western interlopers. Read Mike's review of documentary "Mountain" on KCActive. The last time Charlize Theron put on noticeable weight for a role was for her Oscar-winning turn as serial killer Aileen Wuornos. This time she portrays a different kind of monster: a bad mom. There's not a decent guy in the lot, and though there seems to be no end to the bald-faced irony that turns the biggest laughs into guilty ones, the movie begins to sag a bit under the weight of their scheming. So why, other than sadistic voyeurism, should viewers put themselves through these travails with Charley? For all its grimness, the film also depicts moments of pure joy, if only as relief. Read Beck's review of "Lean on Pete" at KCActive. The messages being conveyed by this movie are that confidence can go a long way to the realization of goals so long as the bar for those goals is exceptionally low and, for anyone but the rarefied good-looking, possessing confidence is a form of cognitive dissonance; a mental illness. Read Beck's review of "I Feel Pretty" at KCActive. With their latest release, the Blumhouse name has literally been attached to the title, ostensibly as an assurance of quality for horror- and thrill-seekers. This new branding, however, is liable to backfire as Blumhouse's Truth or Dare is a lazy assemblage of stale horror film tropes cast with a handful of fresh-faced young stars from the CW, ABC Family, and MTV networks. For other viewers, however — including, I suspect, Spielberg himself — the perception of the degree to which popular culture has in undated our every waking moment is ambivalent at best. And it's this ambivalence about the role of pop culture in our lives that makes it difficult to view this hero's journey as particularly heroic. Read Mike's review of "Ready Player One" at KCActive. The social satire in the second theatrical release from French novelist, playwright and writer-director Amanda Sthers can't quite be described as "biting." Co-written by American New Wave veteran Matthew Robbins ("The Sugarland Express," "Jaws") the story is too drawn-out and passive to be pointed, but there's still plenty there to chew on. Read the review at KCActive.